SIZING (INCHES)…..ARM SLEEVES unflexed bicep (YS 10-11.25) (YM 11-12.25) (YL 11.5-12.5) (XS 11.5-13) (SM 12-13.5) (MD 12.5-14) (LG 13.5-15) KNEE SLEEVES…….Measure 3″ above Knee (YS 10-11.5) (YM 11.25-12.5) (YL 12-13) (XS 12.5-13.5) (SM 12.5-14) (MD 13.5-15) (LG 14.5-17) Advanced Padding System The B Driven Sports Compression knee sleeve was designed to provide all the benefits of a compression sleeve, along with an advanced padding system to help protect against bruising abrasions, scratches, cuts, and other impact from active performance and competition. BONEZ Pad Placement Our sleeves are designed with individual BONEZ pad placement, designed for maximum pad coverage, flexibility, and comfort. We then independently and completely adhere each pad separately which results in reduced pad separation during performance. 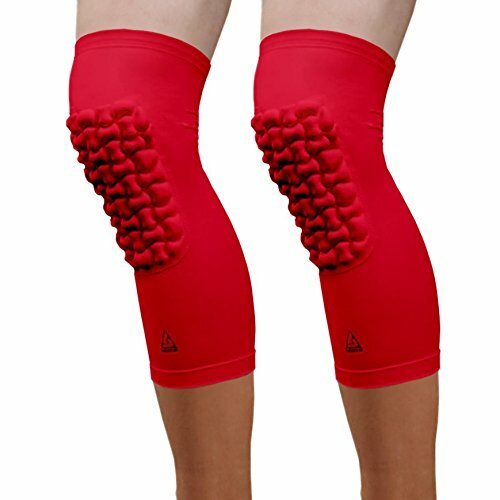 Unlike many sleeves on the market, including the hex and circle pad designs, our pads are not just glued to the top and bottom of spandex fibers, as this results in wide separation of the pads during athletic activity, leading to more potential injury. Reinforced 250GSM Pro-fit Dri-Wick Material Our Padded Arm / Elbow Sleeve is also produced from a reinforced 250GSM Pro-fit Dri-Wick material which is over 20% thicker than the standard arm sleeve. The garment provides moisture wicking performance keeping you dry and comfortable both indoors and outdoors. Provides a warming effect during cool weather conditions and keeps you cool during high heat conditions. The sleeves come in both youth sizes, as well as adult sizes and can be worn by men, women, boys, girls, kids. 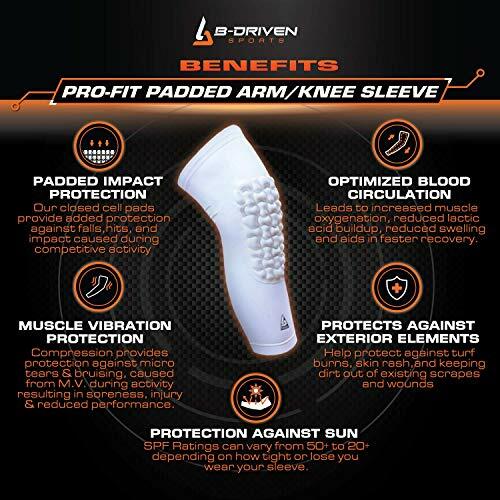 The sleeves are great for basketball, football, volleyball, lacrosse, and other activities where padded protection is desired.100% RISK FREE GUARANTEE…. Free size exchanges, free returns, and full 30 day warantee on all padded shooter sleeves and padded knee sleeves. 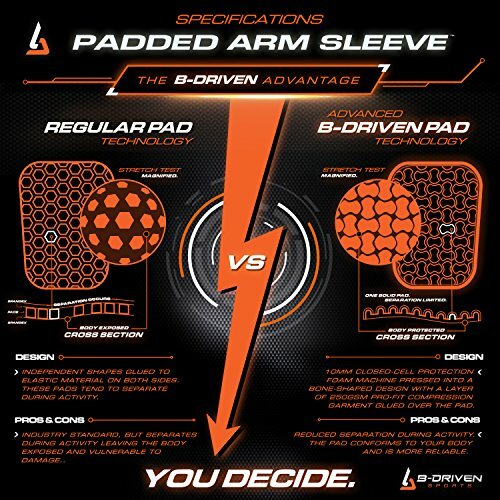 REDUCED PAD SEPARATION TECHNOLOGY… our BONZ EVA pad technology uses a solid pad which does not separate like most hex pad or independent pad products which easily separate and leave you exposed during activity. PROFESSSIONAL QUALITY STITCHING, PADDING, and MOISTURE WICKING COMPRESSION, our arm and knee sleeves are made from an extra thick and dense pad providiong extra protection, along with a 250 gsm material which is up to 20% stronger and comes with a full 30 day warantee.